A. Elastic Surface Waves. Contributors: D.M. Barnett, S. Baste, P. Borejko, A. Bostrom, P. Chadwick, P.L. Chen, S.-E. Chen, S.K. Datta, M. DeBilly, E. Dieulesaint, J. Dunwoody, H. Fukuoka, M. Hirao, S. Hosten, G.C. Johnson, M.K. Kuo, J. Lenz, J. Lothe, K. Majorkowska-Knap, A.K. Mal, P. Olsson, M. Planat, G. Quentin, H.P. Rossmanith, D. Royer, T.K. Wang, P.C. Xu, C.S. Yeh, Y. Zhang, F. Ziegler. B. Nonlinear Elastic Waves. Contributors: P.L. Christiansen, E.A. Cox, N. Daher, E.A. David, J.E. Dunn, R.L. Fosdick, Y.B. Fu, J.B. Haddow, G.A. Maugin, M.P. Mortell, V. Muto, D.F. Parker, J. Pouget, N. Scott, M.P. Soerensen, R.J. Tait, M. Teymur, J. Wegner. C. Wave Propagation in Layered and Bounded Media. Contributors: J.A.H. Alkemade, A. Bamberger, D.B. Bogy, P.R. Brazier-Smith, R. Burridge, H.W. Chang, L.C. Chin, J.W. de Maag, Y. Dermenjian, H.A. Downey, L.B. Felsen, C. Gabay, W.A. Green, M. Itabashi, B. Jensen, P. Joly, K. Kawata, J.M. Klosner, Z. Konczak, B.J. Kooij, S.Y. Lee, I.T. Lu, C. Molina, F. Muir, Y.H. Pao, F. Pastrone, A.D. Pierce, H. Schmidt, M. Schoen, N. Sugimoto, H.J. Yang, F. Ziegler. D. Fluid/Solid Wave Interaction. Contributors: D.B. Bogy, A.M.B. Braga, S.M. de Vries, M.J. Ghaleb, S.M. Gracewski, G. Herrmann, G.C. Hsiao, R.E. Kleinman, M. Piau, F.J. Sabina, L. Schuetz, J.R. Willis. E. Scattering of Elastic Waves. Contributors: J.D. Achenbach, A.I. Beltzer, A. Bostrom, C.H. Chapman, R.T. Coates, M. Codegone, J. Corones, G. Dassios, S.K. Datta, A.T. de Hoop, G.C. Gaunaurd, T. Ha-Duong, W.S. Hall, M. Kitahara, M.K. Kuo, P.A. Martin, J.J. McCoy, E. Meister, K. Nakagawa, M. Nakano, P. Olsson, L. Peterson, D. Quak, G. Quentin, W.H. Robertson, C.M. Sayers, F.O. Speck, H.J. Stam, M. Talmant, H.J. Yang, M.F. Werby. 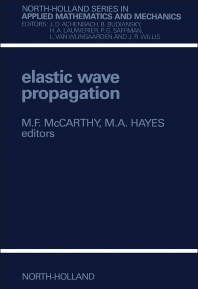 F. General Theory of Elastic Wave Propagation. Contributors: M. Aron, L.M. Brock, P.J. Chen, S.C. Cowin, R.E. Craine, J.G. Harris, M. Hayes, G.C. Hsiao, A.C. Morro, A.N. Norris, D. Ryan, M. Sayir, W.L. Wendland, M. Ziv. G. Magneto-Thermo-Electromagneto Elastic Wave Propagation. Contributors: Ph. Boulanger, M.M. Carroll, S. Dost, R.E. Green, R.K.T. Hsieh, W. Kosinski, G.A. Maugin, M.F. McCarthy, D.F. Nelson, J.P. Nowacki, N.H. Scott, H.F. Tiersten. Author Index. This volume contains a timely collection of research papers on the latest developments in the ever-increasing use of elastic waves in a variety of contexts. There are reports on wave-propagation in various types of media: in both isotropic and anisotropic bodies; in homogeneous and inhomogeneous media; in media with cracks or inclusions in random media; and in layered composites. The bulk of the papers are concerned with propagation in elastic media, but also included are viscoelastic, thermoelastic and magneto-electroelastic wave propagation, as well as waves in porous and piezo-electric bodies. Consideration is given to propagation in bodies as diverse as stretched elastic strings to surfaces such as thin walled cylinders, and thin films under stress. Applications considered include the determination of the depth of cracks; analysis of ground motions generated by a finite fault in seismology; surface wave spreading on piezo-electric solids; and dynamical stress intensity factors. Most of the papers are theoretical in nature, and many are complemented by numerical studies. Also included are a general survey on experimental techniques, and reports on experimental work. The volume will be of interest to those who do theoretical studies of elastic wave propagation and to those who apply elastic waves whether in seismology, non-destructive testing, the fabrication of devices or underwater acoustics, etc.